Many established and up-and-coming artists in cumbia, rock, electronica, funk, soul, reggae, hip-hop, and various other genres attended the 10th Annual Latin Alternative Music While most of the artists at the LAMC spent their days in the hotel mingling with record executives, the nights were another matter, with performances at S.O.B.’s, Bowery Ballroom, Prospect Park Bandshell, and a conference-closing Central Park SummerStage show, featuring Latin hip-hop superstars Calle 13.Washington City Paper was there to document the sights and sounds thatcaptivated over 10,000 concert-goers , and to talk to many of the artists in attendance about their future projects and upcoming D.C.-area shows. Those who frequent the Eighteenth Street Lounge in Dupont Circle, might recognize the name Federico Aubele—or are at least familiar with his mix of Argentine tango and electronica that’s often played at the lounge. Aubele’s sound certainly grabbed the attention of Thievery Corporation DJ and ESL Music co-founder Eric Hilton. Back in 2001, Aubele was a DJ in Berlin and played Thievery Corporation tracks during his sets. That year, Aubele sent Hilton a demo, and was thrilled when he heard back from Hilton via e-mail. 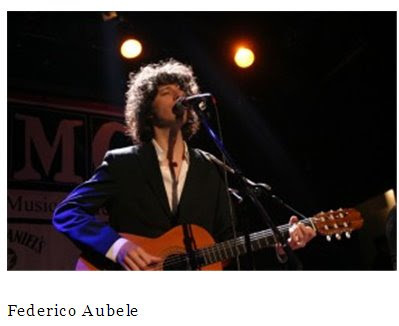 “He gave me a pretty thorough critique of the demo,” said Aubele in a sit down interview at LAMC. “Eric gave me pointers on what to do, how to improve tracks, what tracks to keep, which ones to cut. And shortly after, I began touring with his band, Thievery Corporation.” Now that Aubele is an accomplished performer himself, he’s been touring non-stop worldwide as a headliner for the past few years. He occasionally performs small, intimate acoustic sets at Eighteenth Street Lounge and plans to play the 9:30 Club in October. One of the major goals of the LAMC conference is to highlight artists that have yet to grab headlines, but are on the verge of breaking through as major artists. Mexican MC Niña Dioz is well on her way, having opened for everyone from Ghostface Killah to Mexican rap giants Molotov and Plastilina Mosh. She generated buzz after her U.S. debut at this year’s SXSW festival. When asked about the hip-hop scene in her native Mexico, Dioz, who made her LAMC debut this year, said in Spanish, “It’s growing slowly but surely. It’s been going on for about a dozen years, strong, and I think it’ll really take off over the next five years.” She has been groomed by Mexican hip-hop pioneers Control Machete, who also hail from her hometown of Monterrey, whom she met a few years back at a concert. Machete’s DJ Toy Selectah is producing her new album Nueva Escuela, set for release in October. Natalia Lafourcade has always been a big fan of Julieta Venegas, arguably the queen of Mexican pop-rock. But little did Lafourcade know that the feeling was mutual. “I was driving my car in Mexico when I get a call, and I hear this distinctive high pitched voice, ‘Hola, it’s Julieta,’” said Lafourcade, in Spanish. “There was no way this was a joke, her voice you can’t fake. And I was thrilled when she asked me to be part of her Unplugged album.” Venegas’ MTV Unplugged album went on to become one of the biggest hits of 2008. Lafourcade, who in addition to her prowess as a singer is also an accomplished instrumentalist, performed as part of Venegas’ orchestra, playing various instruments throughout the recording. Fast forward one year, and it was a no-brainer for Venegas to repay the favor, taking part in the title track for the recently released Lafourcade album Hu Hu Hu. With a name like “The Velvety Ones,” it’s no surprise that Aterciopelados are best known for earthy feel-good music. The duo’s latest album, Río, features music about their beloved Bogotá River—which was majestic when they were young, but is now a polluted mess. The critically acclaimed 2008 album spreads this message through progressive rock music, loaded with electronica beats and indigenous sounds found in their native Colombia and other Latin American countries. 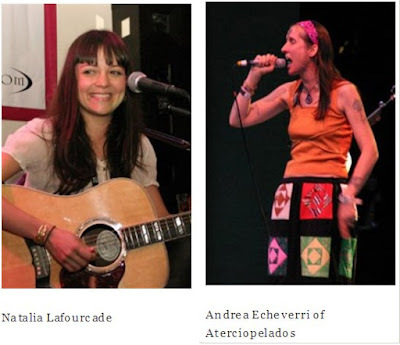 “We’re big fans of Andean music,” said Atercio’s singer Andrea Echeverri in Spanish. “We’ve added a full-time flautist that can [play] the [Andean panflute] zampoña.” Bandmember Héctor Buitrago added, “It’s an indigenous sound we’ve always liked, and we love that we have it as part of our band when we tour.” Aterciopelados perform in D.C. often, having played shows at the defunct Nation nightclub in Navy Yard, the Kennedy Center, and most recently at the State Theater, back in April. 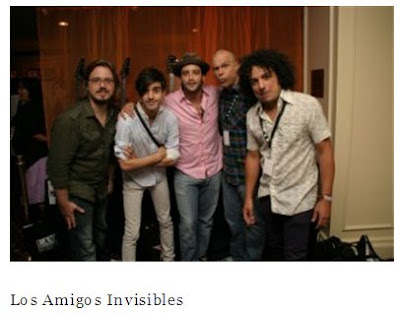 Los Amigos Invisibles are no strangers to D.C., having played to crowds at the Black Cat, the Kennedy Center, and, just last month, a sold-out live set at the 9:30 Club. That show was one of a select handful of concerts LAI performed recently to promote their latest album, Commercial. “We’re pretty busy people,” said Amigos lead singer Julio “Chulius” Briceño, whose band blends ’70s and ’80s funk with various cumbia, jazz, and gozadera from their native Venezuela. “People always ask me when we started this tour but the truth is—even though this is called the ‘Commercial’ tour—we’ve been touring non-stop for the past 10 years. D.C.’s 9:30 Club has always been one of our favorite venues to play during that time.” While best known for their very dance-friendly and animated live shows, the band has gone from being a New York City-based party band to enjoying more mainstream success in recent years. “What I like best about ‘Commercial’ is that it’s our most tight album yet,” said Briceño. “We used to do long eight minute-plus tracks that went on and on. They were fun, but we feel our new songs are proof of our constant evolution.“We’ve practiced these songs in front of our live audiences for two years now, and we’re excited to have the album come out,” he continued. “We’ve been playing music together for almost 20 years, and if you can’t evolve your music at this point, you might as wel l open a restaurant, serve people food instead of music.” When you mention percussion andhip-hop, few have been more involved in that fusion than Cypress Hill’s Eric Bobo. 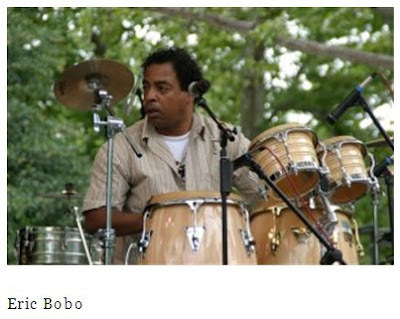 The son of New York City Latin jazz musician Willie Bobo, Eric joined Cypress Hill when the Beastie Boys, whom he once performed with, decided to take a break from touring in the mid-’90s. Bobo and Cypress Hill have been inseparable since, with Bobo’s percussion adding a new element to the group’s already impressive sound. “When you look back to the origins of hip-hop, it was all about live instruments,” said Bobo, whose debut solo album Meeting of the Minds was released last year. “And percussion music was the key.” Look for more of that percussive element—Bobo’s bongos, drums, and all—in a new Cypress Hill album, its first in five years, to be released in late 2009. Bomba Estéreo was one of the busiest bands at the LAMC. Not only did they put on a thrilling show at the Bowery Ballroom, but also did animpromptu set at D’Antigua in Queens , opened for Calle 13 at Central Park SummerStage, and followed that up with a set at S.O.B.’s. Conference attendees seemed more than happy to watch the high-energy Colombian band bring their version of “psychedelic cumbia” to various venues. “We love what we do,” said Bomba lead singer and MC Liliana Saumet, in Spanish. “We’re like a bomb in your stereo, ready to be lit up and explode in your ear!” Their mix of cumbia with champeta, reggae, hard rock rhythms and Saumet’s raps made their crowds hop and bounce throughout their sets, particularly on the hit single, “Fuego.” While the Central Park audience was impressed with Bomba’s explosive opening set, few can top that level of energy unless it’s five-time Latin Grammy winners Calle 13. They are a highly entertaining hip-hop group that started out with their global hits “Se Vale Tó- Tó” and “Atrevete-te-te” (both of which sport incredibly catchy choruses that were screamed by the thousands of Puerto Ricans at the Central Park show) from of their 2006 self-titled debut. 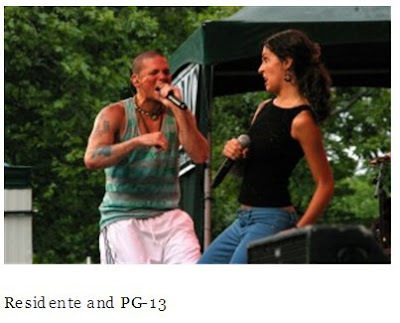 Calle 13 is a family affair led by Residente, his half-brother Visitante, and their sister PG-13. While Visitante plays to the side of the stage at most shows—hopping between guitar, keyboard, and various other instruments—his boisterous siblings take center stage. Their Central Park set had elements of jazz, salsa, tango, cumbia, bossa nova, and electronica. Residente’s spit-fire rhymes flowed perfectly with the versatile PG-13—who displayed her soulful vocals on the band’s ballads, and served as hype-man (er, hype-woman) and second MC on other tracks. The highlight—other than the extended 10-minute party version of “Atrevete-te-te”—was the band’s Michael Jackson tribute. After a brief break, the band donned sunglasses and bedazzled clothing, then busted out in dance to MJ’s “Thriller.” The face of the band will always be the charismatic Residente, who often smiles mischievously at the audience, hops up and down like a pogo stick and deliver perverse, but crowd-pleasing, dances. But at the Central Park show, PG-13 took a much larger role compared with previous concerts, particularly the group’s only D.C. concert to date, which took place at the 9:30 Club back in October 2007. “We remember that show, totally. Amazing vibe and energy coming from the audience,” said MC René Pérez Joglar, a.k.a. 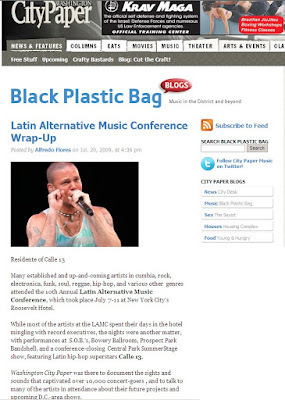 Residente, after his Central Park show. “We hope to make it back once our crazy schedule allows us to.” Calle 13 has been touringand producing Grammy-winning records at a breakneck pace since then, but somehow found the time to make a documentary. Their film, Sin Mapa, is about their journeys through South America and the land’s indigenous culture and art. The movie will be available on iTunes and DVD on July 28. Check out more photos from the LAMC here.